San Francisco Municipal Railway Johnson "D" Shown in a White Model 798 Bus. If you rode trolleys, street cars or buses from the early teens until the late 1960s there is a better than average chance that the token, nickel or dime or in later years the quarter that you used to pay your fare was dropped into a Johnson or Cleveland farebox. These venerable and well-made boxes were found on a large percentage of transit systems large and small in the United States. The name Johnson Farebox came from its founder Tom Loftin Johnson (1854-1911). He was a businessman, U.S. representative, mayor; born near Georgetown, Kentucky. Moving about the south during the Civil War, he had little formal education. Settling in Louisville, Kentucky, he worked for the street railroad owned by members of the du Pont family, and gained their respect when he invented the first farebox for coins in 1880. In May 1888 he affiliated himself with the Saint Louis Car Company. You could buy a streetcar from them, and it came equipped with a fare box -- ready to go! After his death, the company continued as the Johnson Farebox Company. In these early years fare boxes were not that widely used. Most of the early streetcars were set up in a way that the conductor would walk around the car and hand collect the fares and ring them up on an overhead fare register. This register was mounted on one of the bulkheads near the ceiling. This system worked fine but did lead to one potential problem for the transit companies and that was "knocking down". This came about when not all of the fares were rung up as they were collected. Many of the streetcar companies hired spotters to watch the conductors to see that all collected fares were rung up instead of one for me and one for you. 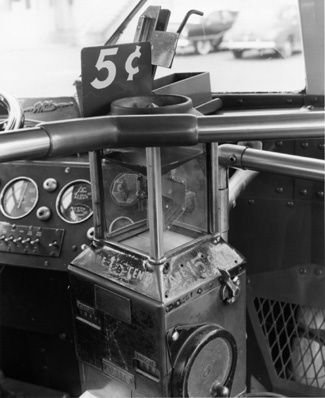 In the early part of the century a type of car known as a PAYE (pay as you enter) or pay as you pass the conductor became standard on many streetcar properties and the use of a fare box became more practical. This also kept everybody honest. 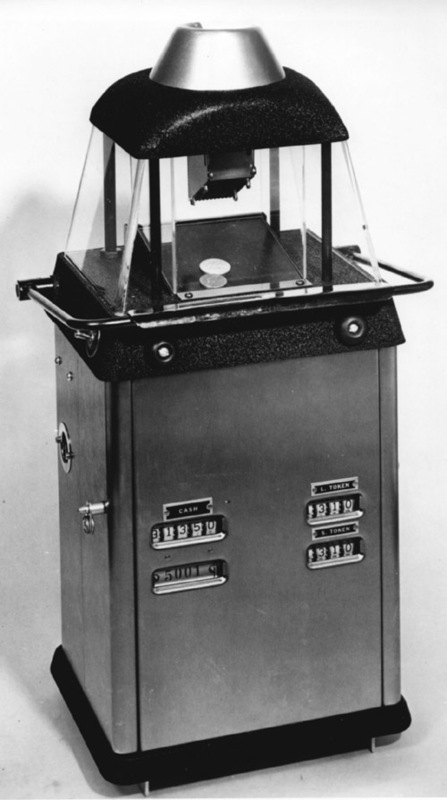 In 1909, 1912 and 1914 Tom L. Johnson was granted patents to build and refine a registering fare box. 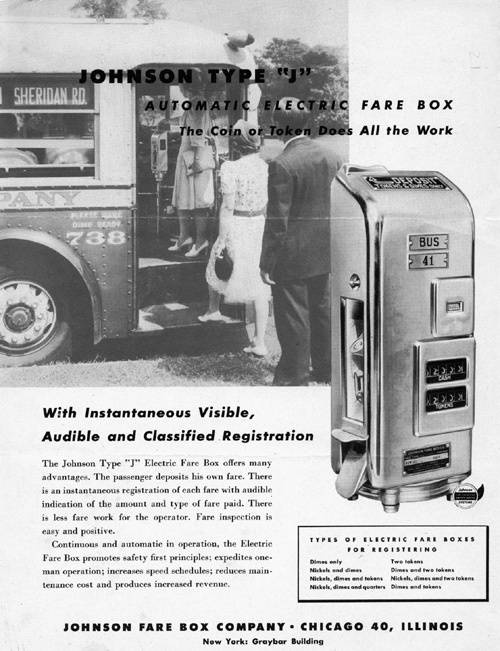 This fare box was to evolve into the Type D that was the main stay of the Johnson Fare Box Company for many years. The early models had a larger body but the same registering mechanism. Shortly thereafter the standard Type D design size as we know it came into being. This basic design continued with some minor modifications until after World War II. The early models were manual "crankers," where by the operator or conductor cranked a handle on the side to run the money through the counting mechanism. Then he or she took the change out of the bottom. The cyclometers on the faceplate registered the money that passed through. At the beginning of the run or shift the operator or conductor took a reading. At the end of the run or shift another reading was taken and he or she was responsible to turn in the amount of money that was registered. These counting mechanisms were very well made and accurate, and there was very little chance for error. In the 1930s when one-person crews were coming into being, an electric version of the D box was developed. This model had a 12volt motor attached to the bottom of the main housing by means of a belt connecting two pulleys. The electric motor did the work of cranking the box. Many of the earlier D boxes were motorized as Johnson sold a kit to do this. The motorized boxes were taller than the manual ones. In the early years Johnson made another model, the J box. This model was not as widely used as was the D. It was more common on small systems that had a single coin fare. The J was slow to load since it took one coin at a time and was not practical on a big city system that had heavy patronage. The D boxes could take multiple coins at the same time, which made for faster loading at stops. Both types of boxes were factory set to take any type and size of coin or token as specified by the transit company ordering them. The J box only came as an electric model. The largest coin that these two models could take was a quarter. 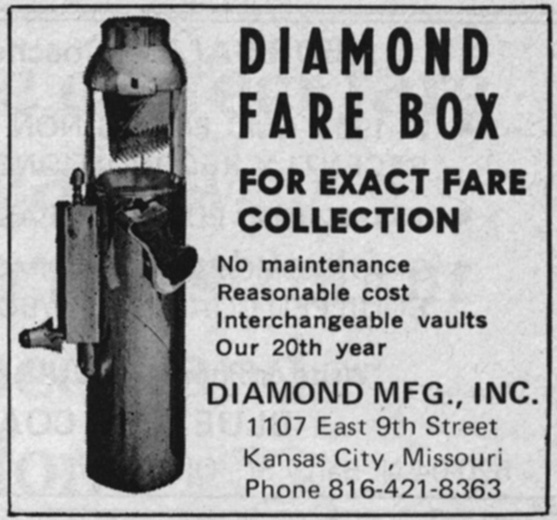 As the fares went up, many of the earlier boxes that did not take quarters were modified . Some time before World War II, the Johnson Fare Box Company acquired the Cleveland Fare Box Company. This company only made manual dump boxes where the money went into a vault. The name Cleveland Fare Box was retained for that model, but had Johnson Fare Box Company name added to the oval builders plate attached to the front of the box. Cleveland had a very good design and Johnson did little to modify it. The final version of the Cleveland, the type 5, had no builder name anywhere on the body but could still be recognized as a Cleveland. These boxes took any size coin but were not suitable for paper money unless it was folded twice. The paper dollars would open up and hang up in the chute in the tower. These boxes are still in use on some systems. Many have had the baffle chutes removed in the tower to allow paper money to go through more easily. In the late 1940s, the D and J models dropped out of production and were replaced by a more streamlined model. 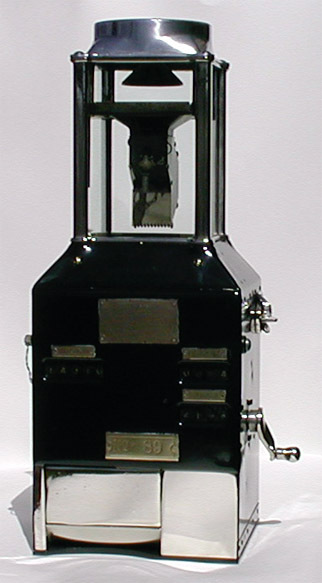 The K box came into being with its stainless steel body and re-designed tower. The earlier Ks sat on a pedestal and the later versions had a two piece body that extended all the way to the floor. The counting mechanism on the Ks was identical to the Ds except a clutch was added to the main shaft in place of the lead sheer pin. 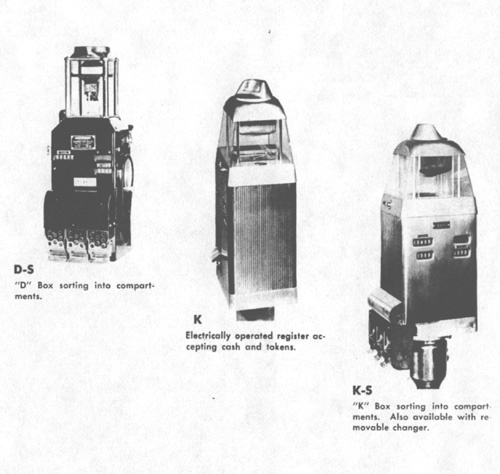 A short time later the K50 model was offered which designated that it took half-dollars. The K25 only took up to a quarter. The very late K50s even took the Susan B. Anthony Dollar coin. The K boxes were available either as a model where money could be retrieved after it was registered, or as a vault box. Systems that used K vault boxes as well as Clevelands issued their operators a change fund. The one big thing that finished off the D boxes was the movement in the late 1960s where street car and bus operators carried no change. This was done to curb the rash of robberies of transit personnel. 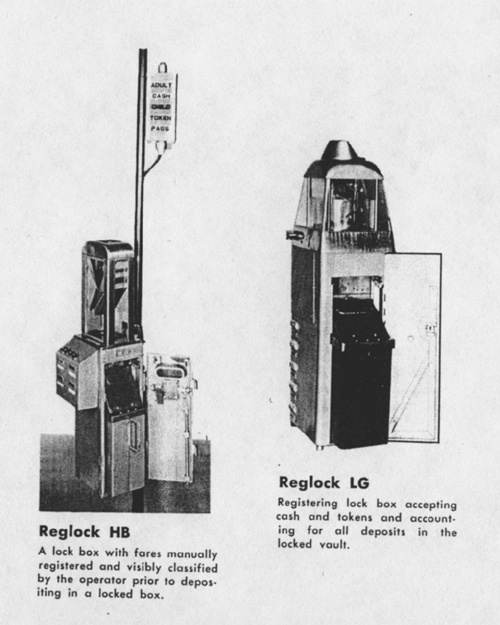 When this policy was put into effect, transit systems were required to have fare boxes with vaults. In 1970 when Los Angeles went to an exact fare policy, all D boxes were withdrawn from service. This was the most recent use of the long time flagship D boxes that I know of by a major transit system, in their original form. Omaha, however, added lockable vaults, allowing continued use of the D boxes well into the 1970's. In the mid 1960s the name Johnson Fare Box Company disappeared from the scene when the company was absorbed by Keene. The new owners continued the K box line, and now they were called Keene Boxes. The Cleveland line was also retained but, retained its Cleveland name. In the 1980s Keene was absorbed by General Fare Industries (GFI), who also later took over the Duncan Fare Box line to get the dollar bill track design. 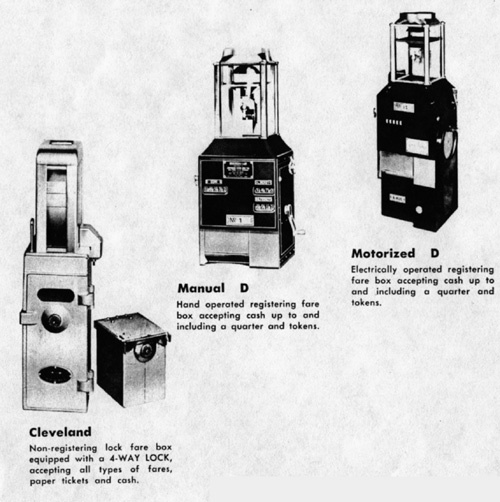 GFI continued the K and Cleveland line until they came out with their current model. Currently the two major builders of fare boxes are: GFI and Cubic. These state of the art boxes come equipped with a computer and can take paper money, tickets and any size coins and tokens. They are equipped to receive any kind of data fed into them by the transit operator collecting the fare. This data is extracted when the box is opened electronically to empty the vault. There are still two other builders, Diamond and Main, who produce manual dump boxes. My favorite box is still the D. These are the most interesting and seem to be the most collectible. For years as a kid riding the San Francisco Muni street cars and buses I used to watch the nickels and dimes make that familiar ring as they went through the tower and the familiar clicking as they were registered. It was not until years later that I found out the purpose of the little ball and pin attached to the chain. If this ball and pin were out of the holder it indicated that the box had been turned upside down and possibly money dumped out of it. Occasionally one of these old fare boxes will turn up at a flea market, swap meet, antique store and even an online auction. The prices seem to vary quite a bit. A lot seems to do with the physical condition. As mentioned earlier the most collectible model is the D. The average price for one of these seems to be around $100.00. Any of the electric boxes can be run with a 12volt, 10 amp battery charger. The J box requires 20amps. An electric D can be run manually, if you disconnect the belt. If you are going to pay a high price for a D box, you will want to make sure that it counts and registers the coins without a problem. Most of the time, you will find that the crank turns freely which indicates that the lead sheer pin on the main shaft is broken. This is made to shear off to prevent breaking a gear or something else if the mechanism jams. This is caused usually by a long period of not being used, and the cyclometers and other parts of the mechanism have got gummy. Usually a good cleaning and oiling of the moving parts will get it going. Another more serious problem could be in the lifting cam mechanism that determines the size and thickness of the coin. If there is too much wear with this part the mechanism will jam, especially with a dime. The parts to repair this are no longer available and this could make the box just a " looker". Another problem can be the lugs on the coin disk being so worn that certain coins are not even picked up to run through the counting mechanism. Do not pay too much for a D box that does not work. It may be just a simple repair or something that cannot be repaired at all. 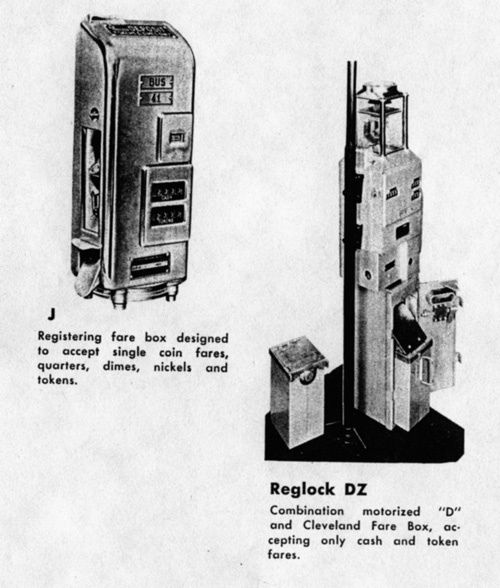 Click here for a reprint of an article on Johnson fareboxes from February, 1951 issue of Mass Transportation magazine. We welcome any questions and comments and thank you for your visit to this site.